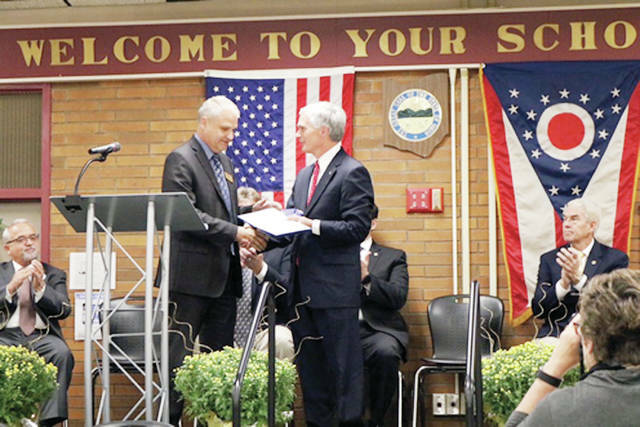 District 5 Congressman Bob Latta (R-Bowling Green) participated in the 50th anniversary celebration of Four County Career Center in Archbold by presenting a flag flown over the U.S. Capitol building to Superintendent Tim Meister. The ceremony also included the induction of six former students into the “Wall of Fame” and a distinguished service award for former superintendent William Spiess. Latta commended the FCCC teachers, administrators, and students for their efforts. https://www.fcnews.org/wp-content/uploads/sites/45/2018/10/web1_FCCC-flag.jpgDistrict 5 Congressman Bob Latta (R-Bowling Green) participated in the 50th anniversary celebration of Four County Career Center in Archbold by presenting a flag flown over the U.S. Capitol building to Superintendent Tim Meister. The ceremony also included the induction of six former students into the “Wall of Fame” and a distinguished service award for former superintendent William Spiess. Latta commended the FCCC teachers, administrators, and students for their efforts.